AO Printworks studio was established in 2004 and was formed by Stephen Hicks who has over 35 years of experience in the print industry and now specialising in wide format digital printing. We supply private individuals, retail outlets, fleet vehicle operators, shopping centres, art galleries, trade customers, showrooms, exhibitions, hotels, parties, leisure centres, photographic centres, local authorities, cinemas, and many many more. Based near Redruth in Cornwall, the Studio accommodates all of the clients needs, and offers bespoke digital printing solutions with expertise advice. 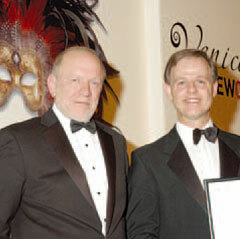 Stephen receiving his award for Best Large Digital Format Printer in Italy 2006.